disadvantages of rooftop solar Archives - Solar Love! Home Tags Posts tagged with "disadvantages of rooftop solar"
A company in Austria has come up with an intriguing idea — a ground-mounted solar array in the shape of a flower that tracks the sun. 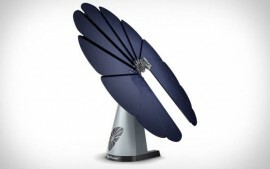 It says its SmartFlower outperforms solar panels by up to 40%. The SmartFlower has several photovoltaic panels that fan out like the petals of a flower during the day to capture energy from the sun. Since solar panels are most efficient when they are pointed directly at the sun, the SmartFlower tracks the sun east to west and up and down all day long to extract the maximum possible energy from the available sunlight. There are other advantages to the SmartFlower. Because it is mounted on the ground, if you move, you simply unbolt the SmartFlower and take it with you. There’s no need to purchase another rooftop solar system for your new home, according to Tree Hugger. Rooftop solar systems come with some built-in headaches for homeowners. What if your roof ever needs repairs? First you have to dismount the solar panels and then re-install them when the work is complete. Some homeowners have run into problems selling homes with a leased solar system on the roof. If they entered into a long-term lease for their system, the new owners need to get approved by the leasing company before the sale can go through. Other buyers aren’t interested in home solar and refuse to take on the lease payments at all. The SmartFlower avoids those issues. And because it is mounted on the ground, any repairs or maintenance can be carried out conveniently without having to climb up on the roof. At night or during stormy weather, the “petals” of the SmartFlower fold away until the sun comes back up or the storm passes. You can watch the SmartFlower in action at the company website. The SmartFlower is available in eight totally cool colors, including Berry, Ocean, Amber, and Mermaid. No pricing information is available at this time. It should be noted that solar panels that track the sun got priced out of many markets as the cost of solar panels plunged. Whether the SmartFlower can actually compete on cost seems unlikely, but the upside is that it can also count as art… and what’s the value of art?